Arm and Hammer toothpaste is a quality product that is available in several variations. But there's one problem; I think all the toothpastes by Arm and Hammer are pretty much the same, with only small differences in taste and texture! In a way, this is great news, because you can pick the one that you like with regard to flavor and texture, and you know you will still be getting the quality product that Arm and Hammer are famous for! So, which one should you use? It really comes down to your own taste and preference. You won't go wrong with any of them! Baking soda, to help with stain removal. Peroxide, to provide a slow gentle whitening, and also to help your gums. Fluoride, which strengthens tooth enamel against decay-causing bacteria. The Arm and Hammer toothpaste that I like the best is the Advance White with Baking Soda and Peroxide. As the name says, it contains baking soda, which is a very mild abrasive. This can remove surface staining, such as tea, coffee and light tobacco staining. BUT you have to use the toothpaste correctly! What do I mean by that? It's pretty simple, really, but it's something that a lot of people neglect, and then they wonder why they aren't getting any results from the toothpaste. HERE'S MY TIP: You have to brush your teeth with the toothpaste FOR LONG ENOUGH to give the ingredients time to work! You're probably asking "How long is "long enough?" The answer is a LOT longer than you may think! At least 6 (yes, six) minutes. At least. Minimum. And longer is even better! 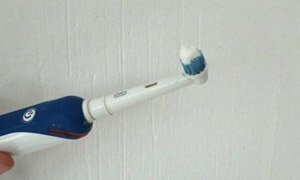 You may need to top-up the toothpaste with an extra little blob on you brush half-way through. If you are wondering where I get that figure from, here's the answer. It takes at least 10 seconds for an electric brush to remove all the plaque from one tooth surface. It is also just about long enough for baking soda to have a decent chance of shifting surface staining from a tooth. You don't have to scrub hard - you have to give it TIME! So, 10 seconds per tooth surface. That's for ONE tooth surface. Multiply that by 2, because every tooth has an outer surface next to your cheek AND an inner surface next to your tongue. Then multiply that by how many teeth you have. Most folk will have 24 to 28 teeth. So 20 seconds per tooth multiplied by 24 teeth equals 480 seconds, or EIGHT minutes! SO, as you can see, SIX minutes is the minimum time needed, if you want to get anything out of toothbrushing over and above merely freshening you breath. You also need to use a good quality toothbrush! For more information on that score, visit my best electric toothbrush review page. The baking soda component of the Advance Whitening toothpaste gives it a slightly odd texture - if you've never used a baking soda type toothpaste before, you'll probably find it a little strange at first! There is a sort of powdery feel to it, which doesn't really go away as you brush. Even when you spit out afterwards (don't rinse with water! ), you still have that slightly powdery sensation for 5 minutes. It's not a problem, at least it's not for me, but some folk may find it a little odd at first. The next component in Arm and Hammer toothpaste is peroxide. This is in a very low concentration, but will have 2 effects; the peroxide will have the potential to kill bacteria along the edges of your gums, helping to reduce inflammation and gum disease. AND remember to floss between your teeth too! You only have to floss the teeth that you want to keep. I hope that means ALL of them! The peroxide can also react chemically to release oxygen, which can penetrate the surface of your tooth enamel and break down stains within the enamel, leading to a gradual whitening of the teeth. Arm and Hammer toothpaste is a good quality choice, whichever variation you choose.